Affiliate Disclosure Policy - What does it mean? An affiliate disclosure policy is about disclosing (revealing or explaining), the purpose and well being of a blogger in his or her published posts whether written or in audio visual. 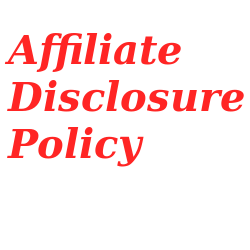 This affiliate disclosure policy is important because advertisers offer bloggers or content providers payment or gifts to create content about specific products or services. These content generators or blogger’s take interest in the product or service which may be part of their financial gain. Affiliate marketers want to be clear about the importance of informing the users that they might be an affiliate for some of the products on the site including the laws that make it mandatory. The Federal Trade Commission (FTC) necessitates that the marketer disclose any relationship they have between a product manufacturer or service provider when they write about a product or service. They are not paid to review a product or a service. They will invest their own time to test and review these services or products and pay for the entire cost to produce all audio and/or video recorded about products. By disclosing the purpose of a blog, bloggers are letting readers know more about the information they will be reviewing. Hence, the affiliated disclosure policy must be very obvious and stated in the plain sight — in the body of your post and in your disclosure statement. In order to meet the terms with all the guidelines provided, the disclosures must meet four basic requirements. They must be frequent, clear, conspicuous, and require no scrolling or other type of user action to locate the disclosure. Frequent: Your affiliate disclosure policy must be visual on any page that has a review, suggestion, comment, audio – visual segments or article that promotes a product or service for which you receive reimbursement. Clear: It must be understandable and immediately clear that you may receive compensation for your review or rating. Require No Action:Your affiliated disclosure policy must be immediately evident to a visitor to your site who views a review, ranking or endorsement. A visitor should not need to scroll, click or hover to learn that you receive compensation. Now that you know the importance of Affiliate Disclosure Policy for affiliate websites, You should add these legal Pages on your website if you have an affiliate website. You can buy these Disclosure Policy Pages from WPLegalPages which has ready to use Affiliate Disclosure Policy template and there are more useful legal pages that you would need.